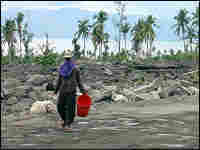 In the Philippines, Religion and Nature Collide Many Catholics in the Philippines see natural disasters as acts of God. But a growing number of religious groups there and elsewhere in the world are encouraging worshippers to give God a hand by caring for the environment. 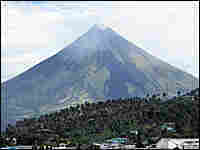 The Mayon volcano near Legazpi in the Philippines. A typhoon in 2006 triggered mudslides that wiped out nearby villages. 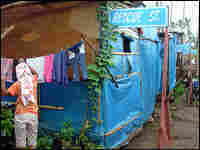 Tarp houses serve as temporary shelters for those who were displaced during the mudslides. A worker collects sand brought by the floods. He will use the sand to build new homes. This is one of the new homes being built to replace those destroyed by the flood. This is a story about what happens when the heavens and the earth collide — and who gets blamed. 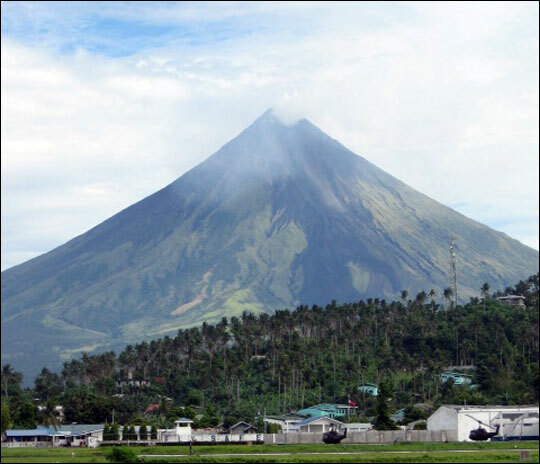 Last November, a typhoon slammed into the Philippines near the city of Legazpi. The wind and rain were so intense they sheared away the slopes of an 8,000-foot volcano. Charlito Valderrama, who was living in a village below the volcano, described it as a "big bomb." Torrents of water, volcanic mud and boulders as big as cars crashed down toward the ocean. Valderrama says his family was running for higher ground when they were swept away. Only three of nine family members survived. "It was two days before they found my wife," Valderrama says. "They found her body in Santo Domingo." Nearly a thousand people died in the typhoon. Valderrama seems sure he knows why the disaster occurred. "It was the will of God," Valderrama says. "It was not because of man." Many Catholics in the Philippines, who make up more than 80 percent of the population, believe that God is responsible for natural phenomena. But it's a sentiment the church is trying to change — and not just in the Philippines. The Vatican has become very interested in climate change. This year, Pope Benedict XVI hosted a conference on global warming. And he has announced plans to preserve forests, install solar cells, and make Vatican City a carbon-neutral state. The Vatican considers global warming a pressing issue — in part because there is evidence that man is contributing to the problem, and in part because the effects will be felt most intensely by the poor. 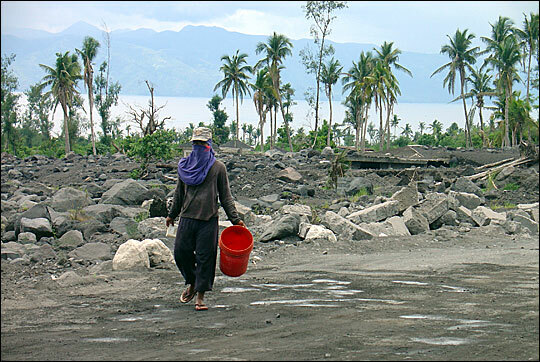 In addition to being poor, the Philippines is vulnerable to extreme weather. In a warmer world, these islands are likely to see more flooding and more intense typhoons. As a result, Catholic leaders are asking people to do more to protect themselves — and their planet. It is a message that challenges some long-standing views about man's dominion over the earth. One member of the clergy who has been especially vocal is Lucilo Quiambao, 75, the auxiliary Bishop of Legazpi. During the typhoon, Quiambao was in his church, caring for people. He remembers watching the pews come loose from the floor as the waters rose toward the stained-glass windows. "All those benches were floating," Quiambao says, walking through the sanctuary of St. Raphael Church. "You see the blessed sacrament there. Just around two inches from that line was the water." He saved the organ by raising it up onto the altar. But many records of baptisms, marriages and deaths just floated away. The typhoon struck on a Thursday. At Mass on Sunday, Quiambao was surprised to see that the church was full. "I thought people would be angry with God so they would not come," Quiambao says. "But no. They came — most of them would say, in thanksgiving, because at least we are alive." But he says many of them misunderstood God's role in the disaster. So he gave an unusual sermon. "I enlightened the people," Quiambo says. He told the worshippers that it was God who brought order to all of creation. "But it is man who disordered everything and we are suffering the consequences of this." Quiambao says it is also people's responsibility to fix the problem, and the church is helping them. In the Philippines, the task of caring for the earth often falls to younger members of the clergy — like Father Jovic Lobrigo, a Franciscan. Jovic, whose church overlooks an area devastated by a mudslide, likes to remind people that St. Francis is the patron saint of the environment. So it makes sense that he often speaks about what the church calls "stewardship of the earth." "Yes, you are a primary creation," Jovic tells parishioners, "and you have superiority of all beings. But with it is responsibility of taking care of creation itself." Otherwise, he says, the Philippines will eventually have fewer trees and more typhoons. He tells people that truly understanding stewardship requires a long spiritual journey. On a recent day, though, he takes his parishioners on a physical journey. His congregation is helping to carry a statue of Mary from the ruins of an ancient church near the foot of the volcano to Father Jovic's church on the hill. Only the steeple of the old church remains above ground. Lava buried the rest, nearly two centuries ago. Father Jovic says he understands why people blame God for volcanoes and typhoons. "This is the simplest way of rationalizing what happened," Jovic says. "Because if you do that, then you don't blame anybody else but God." That thinking also absolves the individual from responsibility, Jovic says. In Genesis, God gives man dominion over the earth. Jovic says many Christians have interpreted that to mean people can use the earth in any way they like. He says people in the Philippines have abused their power less than the residents of many other countries but that, even so, they need to do more for the earth. And he sees signs that it's happening. The procession of Father Jovic's parishioners winds up past a camp for people who lost their homes in the typhoon. It's the last place anyone would expect to find people worrying about their impact on the environment. And yet, some of them are. 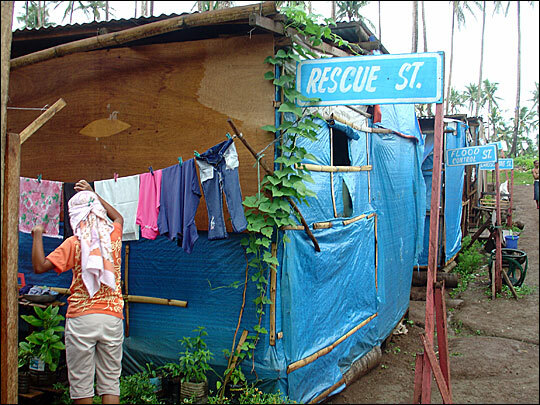 A woman named Josephina Baliktau has spent most of the past year living in a plywood shed covered with a tarp. But she is praising God, because soon she'll have a new house made out of cement blocks. 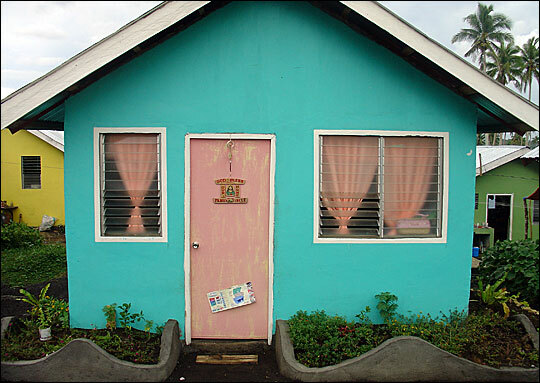 "Little house," Baliktau says over and over as she admires her half-finished residence. 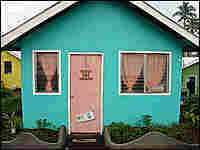 But building new houses like this one has taken a toll on the environment. "When we came here, there were many coconut trees," says Sister Merceline Galeshia. "And since we cannot build with the trees, the trees were cut down." Since then, she says, residents of the camp have decided to plant a new tree for each one lost. "We had cut down 80 coconut trees and were saying, 'Oh, it is something we have to replace or we'll be feeling the consequences of our decisions,' " she says. The new trees, she says, are a way to help make peace between the heavens and the earth. Radio piece produced by Jane Greenhalgh.